This unit will explore briefly, how Canada became independent. 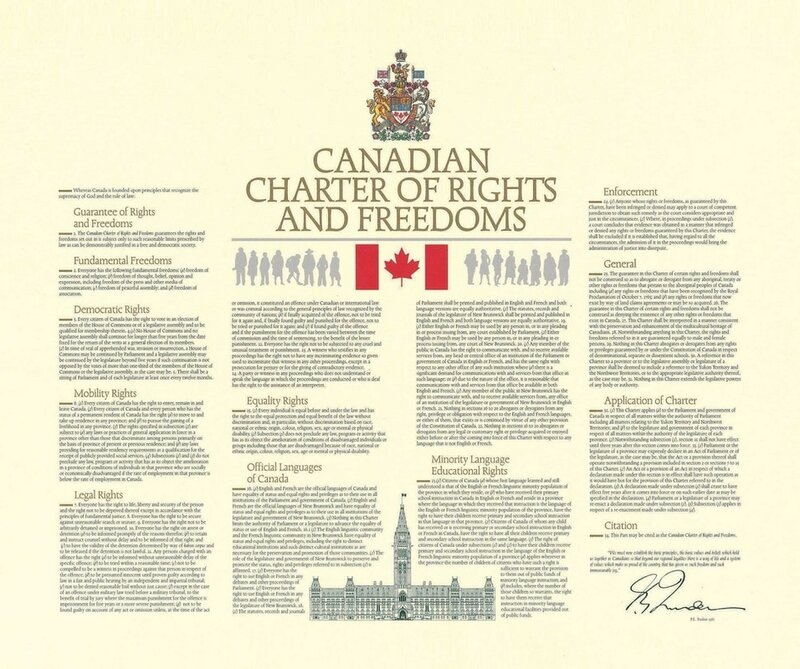 We will spend less time looking at this history of Canadian independence and the construction of the constitution (which is covered in Social Studies 11) and more of a look at the Charter of Rights and Freedoms. 1. We will start with the signing of the Charter of Rights by the Queen and the work backwards, before looking in great detail at the Charter of Rights. 2. We will watch a humorous video on the difference between America and Canada and the length it took each to gain their independence. 3. We will watch a brief video of Trudeau and his legacy of creating the charter. 4. Mr. Fitton distributed a copy of the Charter of Rights and Freedoms to each student. Mr. Fitton will print a sheet for you to take notes on each section of the charter. (See page two of Document below); you may fill in the notes based on the powerpoint, or based on your research through the textbook or the resources found below courtesy of the legal education society. -You will be able to use this sheet of notes as part of your research for your Charter Project. 5. Charter Scavenger Hunt Activity. Use the scavenger hunt document and read / skim pages 99-121 to fill in the blanks. 7. Mr. Fitton showed a few examples of student projects about the charter from other schools. Just to show the variety of ways you can demonstrate your learning on this project. Your imagination is the limit. Students have created "Draw my Life" style videos; claymation; artistic apps; a combination of their art and video; voiceovers with pictures from internet sources; interviews with actors, your own song. Work to teach the class in an engaging way that also satisfies your creative desires or pushes you to try new things. 1. Hook - watch the youtube videos dealing with protests and discuss how it could relate to the charter. 2. Class discussion of the Raw footage and the Newscasts. Discuss primary vs secondary sources. 3. Students will eventually participate in a "Today's Meet" style debate on the Charter of Rights and Freedoms. They will base their arguments principally on two articles from the globeandmail.com - which each student will have to annotate. Or an article from the Toronto Star. 4. Students will prepare for the debate/discussion by doing an annotation of one of the articles below. Watch the following film to review the charter and its history. 2. Students will go to the library round tables. On each table will be a page of the texbook with a Charter Issue Case Study. 3. Students will read the paper at the table and then discuss the charter issue with textbook questions and with self-generated discussion questions. ​Students will rotate to three of six tables every ten minutes for a discussion. Then we will have a debate. See handout below. Students will have three class days to complete their Charter of Rights and Freedoms Project. In this project, students will get to research a section of the charter and use technology to demonstrate their learning. See project handout below. Final class debate - How Private is Your Garbage ---- P. 126/127 of Textbook!